This is my second blog in a series of eight that deal with the same subject (plus a ninth one that summarizes the eight). It shows a late Paleocene Turritella species, which is morphologically different from the Late Cretaceous species that I previously showed. 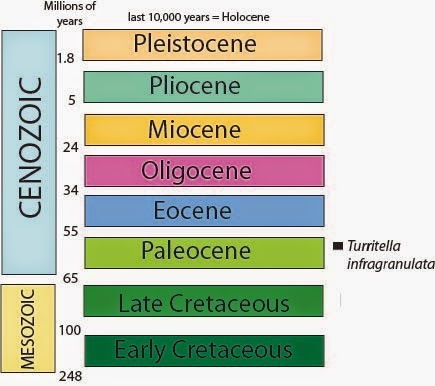 AGE RANGE: Cenozoic (late Paleocene = about 58 million years ago). GEOGRAPHIC RANGE: Northern to southern California. 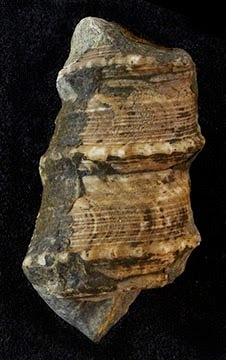 REMARKS: This large species is very distinctive because of the nodes on some of its spiral ribs. In their search box, for Title of Article, type %William More Gabb% and be sure to put a % symbol before and after the name. In the second line, type 1999; and in the third line, type paleontology. for the link, click HERE and then click "Go to link"
The link should take you to vol. 52, issue 04, and p. 11. Also, while you visit this website, you will see many other useful articles on California Geology. Although you can read their articles online, it seems that you cannot download a pdf for your own use.